Round up the kids and this adorable pack of pups for a game of backyard croquet. Playing inside on a beautiful day is ruff. Round up the kids and this adorable pack of pups for a game of backyard croquet. The set includes six colorful dogs, two balls, and two kid-sized wooden mallets. A fun, easy activity that will have them barking—err, laughing—up a storm, it helps with hand eye coordination and teaches them to be a good sport. Made in the Netherlands. Can't wait to give this to my granddaughter. She will love it. Great summer fun ahead. Such a cute and unique gift! 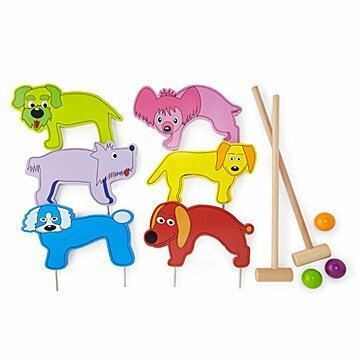 We love everything about the doggy croquet game! This product was so cute and I am so excited to give it to my 3 year old niece for Christmas! It is the perfect gift for play outside! I was visiting my two nieces who are almost 4 and almost 2 and wanted to get an activity for them and their newly fenced in backyard. They love puppies and I remember loving playing croquet when I was little so I thought this was perfect. And They LOVED it! It helps with hand eye coordination, and they also just loved naming and carrying the puppies. Big fun for all! The doggies make this old time favourite family game just a little more fun. The boys love hitting the ball under the doggies bellies! The bright colours and different doggies add to the fun. So far my great newphews think this is cool - teaches hand-eye coordination and cooperation and can be played out doors or in!